You can also /slap to him and he acts like /no , not going to happen to you. Remember both /slap and /dance works on IMAGE of Vargoth (the one you see when you use the staff http://www.wowhead.com/?item=28455 ). In WotLK Vargoth can also be found locked away in a tower at the top of the Violet Citadel in Dalaran. His room is inaccessible though, and can only be gotten into with something like Far Sight. he is in fact not a tauren but a human (hope that clarifies a few things). Sadly, he does not interact with his own image if you use his staff in his room. He said i was getting on his nerves. Last time i visit him. "Welcome <class>, to my humble retreat. I find this place very relaxing and I have always loved being at home in Dalaran. Sometimes though, it can be such a lonely place... such a lonely place." Even after he escaped from the Volet Tower, in the end he just ended up inside another one. And by the way, the "lonely place" he calls his new tower is a reference to Hotel California being a "lovely place". In his retreat Vargoth spends most of his time standing at the bottom of his bed, although he sometimes walks up to his bookcases, or kneels in front of the chest at the bbottom of his bed (like a looting animation, though it does not open). It is a really nice touch from Blizzard to add this room especially for magi to make it that bit special a place to be in Dalaran. Just to point out that his room is accesible, through glitch obviously, normaly if you check my youtube channel (www.youtube.co.uk/user/hazZbazzy) you can find a guide there. It's true his room is accesible even if you don't have the book, through glitching. Do not get your hopes up; if you get up there, he will not give you the pet, and there is no exit. His image will also bow if you /bow at him. 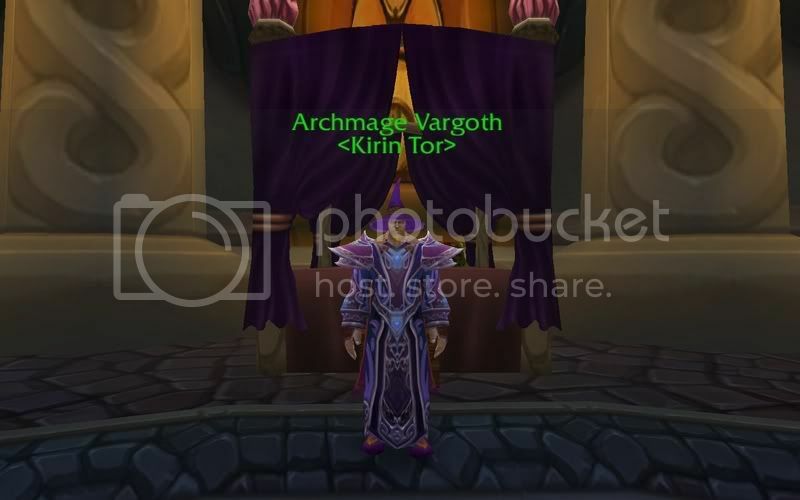 In patch 4.2, the "Image of Archmage Vargoth" is one of the various possible NPCs that will team with you during the "Protectors of Hyjal" daily. The image will not say anything at all and will actually stand up straight when flying. He will only use Arcane Blast, Arcane Missiles and Arcane Explosion for his attacks. Archmage Vargoth wrote a journal while living in Kirin'Var Village. It explains how he ended up in Outland and of his life before and shortly after his imprisonment. The book can be found in Dalaran. I just saw the image of Archmage Vargoth in Orgrimmar near the Midsummer Brazier and he spoke of damage in Westfall. I looked him up and he was gone. Any reference to MOP? "Some scried to remember, some scried to forget." My favourite line from the song, and Vargoth has rapidly become my favourite Kirin Tor fella with his, ahem, somewhat romantic tendency to classical rock. Has anyone tried building a camp fire near him and shoving a guitar in his hands, just to see if he can really sing? And if you think his romantic acts end here, you're in for a surprise because eventually you will come across his wish coin Vargoth's Copper Coin in Dalaran. Guess what? He's expecting his belated wine, wishing "Captain Sanders would hurry up with shipment of wine". I'm surprised that the unlucky Captain didn't answer him "We haven't had that spirit here since 1969..." Was too drunk to rhyme, I suppose. The quests (as far as I can remember) do not give any reputation to any factions, including the Violet Eye and Kirin'tor. Bummer. The quest-item staff used to summon him was never taken away from me, so now I can summon him for the heck of it anywhere I want, anytime I want. Kind of fun to do in Dalaran or other major cities just to confuse people. The specific ghosts you do quests for in Kirin'var go from Hostile to Neutral once you have completed their quest. You can still attack them though. This only accounts for three or four different NPCs though, definitely the minority of the many hostile ghosts wandering the place. When you need to talk to Jaina for the assault the Image of Archmage Vargoth can be found talking to other NPC's in the captains quarters. Plenty of room at the cursed Violet Tower. Any time of year, you can find me here. This is without meeting him before and doing any quests.